The last camping stove I owned was a 15-pound '70s-era Coleman behemoth that took longer to light than actually cook a meal on. So to now use the 1.5-pound Sol cooking system and the Sumo Ti mug is nothing short of magical. I brought two cups of water to a rolling boil in three minutes—way faster than my kitchen stove—and had a mug of Ramen ready in under six, including set up time. It uses an integrated, push-button starter that keeps my hands safely away from the flame. The Sumo mug also locks directly onto the Sol burner assembly which helps keep everything upright and holds 1.8 liters—enough to feed you and your hiking buddies. The entire system—canister base stand, fuel tank, and burner—breaks down and stows in the cup itself. It imparted a slight metallic tang the first couple of times I used it but that faded after a few washings (either that or I just got used to the taste of aluminum). Also the cup is about eight inches deep which makes getting at the last dredges of whatever I just cooked a bit of a challenge. 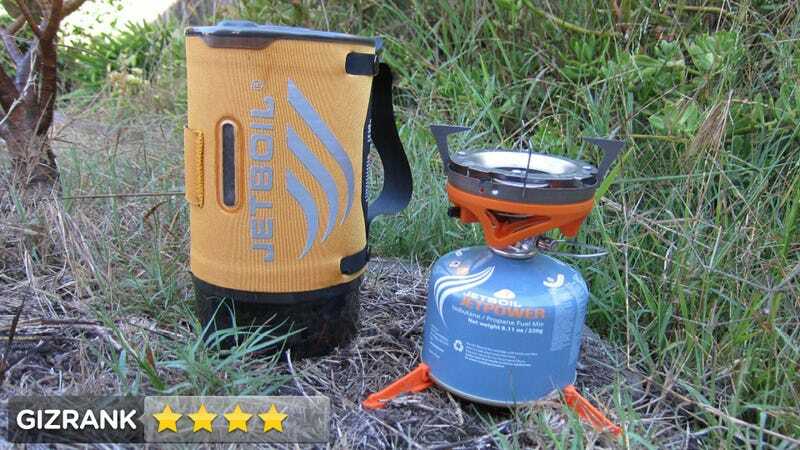 It's a fantastic hiking and camping stove with a lot of output for such a little system. This is definitely going in my emergency kit.